Want to grow your own weed? Land a top job in the marijuana industry? Learn to cook cannabis? Enjoy an unforgettable pot party? The National Orange Show Events Center in San Bernardino is the place to go, organizers of the Cannabis Cup say. About 20,000 pot advocates will whiff marijuana culture at the two-day High Times SoCal Medical Cannabis Cup that ends Sunday, Feb. 8. It’s the latest in a string of marijuana-themed events staged in the Inland area – often on state- or county-owned property – even though California bans recreational pot use. Past shows include the Smokeout concerts founded in San Bernardino by Cypress Hill, the rappers famous for pot-themed tunes. At least two other marijuana events are planned for later this year. Marijuana dispensaries are illegal in the city and events such as Cannabis Cup run counter to the goal of shutting them down, San Bernardino Councilman Jim Mulvihill said. Nothing could be further from the truth, said Dan Skye, editor in chief of High Times magazine, which is staging the event. The cannabis and hemp expo at the state-owned Orange Show started Saturday, Feb. 7. The event, in its third year in San Bernardino, is not open to minors. It celebrates “the incredibly diverse and emerging medical marijuana movement,” the event’s website boasts. Festivalgoers with a medical marijuana recommendation get a wristband allowing them to enter a fenced-off area where they can consume pot legally. The aroma of weed permeated the air Saturday afternoon as visitors smoked marijuana through glass pipes at dozens of booths. Pot lovers indulged in medicated hot wings, cannabis cake, and other drug-laced sweets. Even canines weren’t left behind, as dog owners could purchase hemp-derived treats for their furry friends. They also could pick up literature on pot legalization and purchase clothes and other products made with hemp. It’s not the last Inland event to extol the virtues of marijuana. 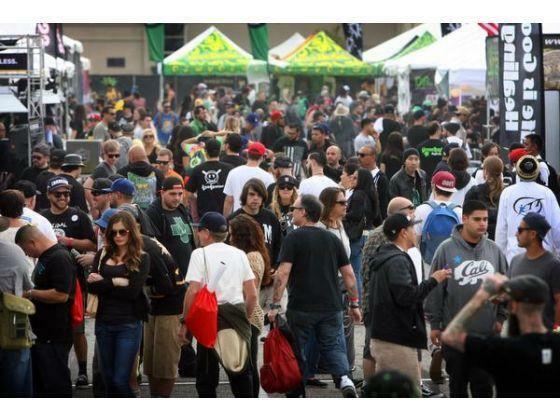 Blaze ‘N’ Glory, a music and cannabis culture festival, comes in May to San Manuel Amphitheater, the Devore venue owned by San Bernardino County. Hempcon Cup, billed as America’s largest cannabis industry, health, lifestyle and culture event of the year, arrives at the Orange Show in November.